Those of us who need to eat a gluten-free diet know how hard it is to find really good, safe-to-eat Chinese food. Even though I live in the New York metro area and Chinese restaurants are everywhere, I’ve rarely indulged since my celiac diagnosis more than a decade ago. But when I do indulge, I’m always fearful — and I’m always disappointed with the food. I can never get my old favorites prepared with care and finesse, and more often than not, I can’t get them at all. Chinese restaurant chefs never seem to have gluten-free oyster sauce or hoisin sauce in their restaurant kitchens, and amazingly, many don’t even have gluten-free soy sauce. Rant #1: Sadly, even though PF Chang’s has a good looking gluten-free menu, it doesn’t come close to serving Chinese food that tastes like what I was used to before my diagnosis. The several times I’ve eaten at this national chain, their sauces were too sweet and their food was overcooked. Rant #2: Why have so many Italian restaurant chefs found a way to cook gluten-free pasta safely, but Chinese restaurant chefs can’t find a way to make a decent and safe-to-eat gluten-free meal? Lucky for us, San J makes excellent an gluten-free soy sauce that is sold in supermarkets and specialty markets around the country (see links below). 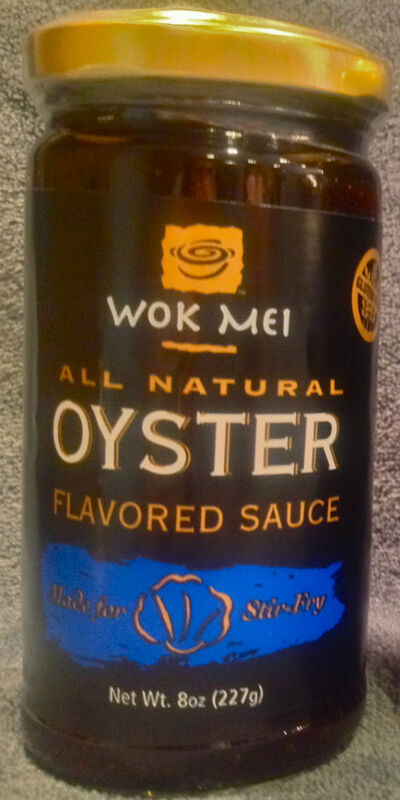 And even better for those of us with serious Chinese food hunger pains, WokMei makes a really delicious tasting gluten-free oyster sauce, as well as a gluten-free hoisin and plum sauce (see links below). WokMei products are available in some grocery stores, but you can also easily order them online as I did (I’m unable to find them in my local stores at this time). I actually buy several jars at a time to save on shipping- and because I’ve been making a lot of Chinese food lately to make up for the last 12 years. With WokMei’s classic, basics gluten-free sauces, you can whip up a feast in no time. Recently I‘ve been making my sister Claudia’s simple stir-fry from our The Gluten-Free Good Health Cookbook several times a month. It’s a great recipe and a great weeknight meal. But if you want to dress it up a bit for the weekend, add the pan-fried Asian dumplings to your menu from my new cookbook Gluten-Free Baking Classics- The Heirloom Collection. Stir-fries are the quintessential week night supper. 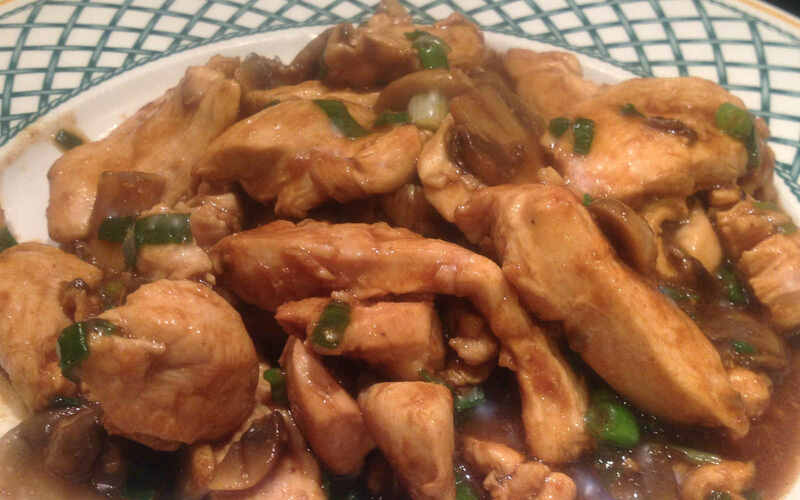 This chicken with oyster sauce is flavorful, easy to make and so delicious it could become habit forming. Serve it with brown rice and some quickly sautéed greens seasoned with a touch of sesame oil for an Asian inspired meal you can throw together in less than 30 minutes at the end of a long day. Heat 1 tablespoon of the oil in a large, heavy skillet or wok over medium-high heat. Add mushrooms and sauté for 2-3 minutes until they are tender and have released their juices. Remove mushrooms from skillet and set aside in a small bowl. Turn the heat up to high under the skillet and and heat the remaining 1 tablespoon oil. Add garlic and cook until light brown. Stir in chicken and ginger. Cook for 2 minutes, stirring constantly. Return mushrooms to skillet and add soy and oyster sauce and cook for 1 minute. Remove from heat and stir in sesame oil and scallions. Serve warm over rice. Stir Beef with Oyster Sauce: Substitute 1 pound flank steak or tenderloin, thinly sliced beef into strips 1-inch wide and 2 inches length. *I recommend San-J Organic Tamari Gluten-Free Soy Sauce or Low sodium Gluten-Free Soy Sauce. Certified Gluten-Free Evaporated cane syrup, all-natural caramel color, salt, GMO-free unmodified corn starch, vinegar, maltodextrin, natural oyster extract. Water, Sugar, Salt, Oyster Extractives (Oyster, Water, Salt), Modified Corn Starch, Caramel Color. As always your recipes look good and they are making me very hungry. Now to go shopping for some of these ingredients. I made this recipe for dinner just this week – on Monday night. It’s really good! And it’s worth buying the oyster sauce, even if you have to have it shipped to you (as I do). Enjoy!